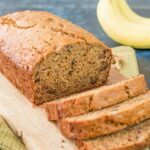 This healthy banana bread is moist, dense and naturally sweet. It’s made with whole wheat flour, extra-virgin olive oil and maple syrup for wholesome goodness without sacrificing any taste. optional 1/2 cup mix-ins like chopped walnuts or pecans, chocolate chips, raisins, etc. Preheat oven to 325F and grease a 9×5 loaf pan. In a large bowl, toss together the whole wheat flour, baking soda, cinnamon and salt. Set aside. In a medium bowl, whisk together the olive oil, maple syrup, eggs, mashed bananas and vanilla. Add the wet ingredients to the dry ingredients. Stir until just combined. Fold in mix-ins. Pour batter into prepared baking pan. Bake for 55-60 minutes or until a toothpick inserted into the center comes out clean. Do not overbake. Let cool for 30 minutes before slicing. Leftovers can be stored in an airtight container or tightly wrapped in plastic wrap at room temperature for up to 3 days.